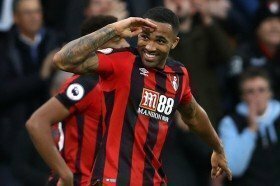 Bournemouth manager Eddie Howe has ruled out the prospect of Callum Wilson leaving the club in January amid the strong interest from Chelsea. The Blues have been closely tracking the striker's proceedings over the past month and their interest was recently revealed by assistant manager Gianfranco Zola. However, speaking in a news conference, Howe has appeared to deny any chances of the striker leaving the Cherries in the New Year by highlighting that the Englishman is very focused on his duties for the club. "I haven't seen the comments. First I've heard about it. Callum's our player, very focused on us. You could see that tonight, gave everything for the team." he said via The Mirror. Wilson has been the Cherries' standout performer during the ongoing campaign and he has already contributed eight goals and five assists in the Premier League this term. His showing has also been rewarded with a call-up to the England national side earlier last month where he scored on his debut against the United States in a friendly.